Garba Shehu, spokesman of President Muhammadu Buhari, says the opposition has more money than the government. 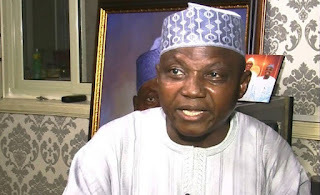 Shehu said the amount of money spent by the Peoples Democratic Party (PDP) during its convention in Port Harcourt should be a major concern to Nigerians. He alleged that some opposition parties have taken it upon themselves to worsen the differences between Nigerians through religion and ethnicity. “This opposition, it must be said, has liquidity of the type that government itself does not have. The US Dollar rain by a major opposition party at their convention in Port Harcourt is a dire warning in this direction,” he said in an article. “This contrasts sharply with the high level of discipline put in place through the Treasury Single Account (TSA) being implemented by the Buhari government. “It is a matter for great concern that the leading opposition parties have resolved to undertake a campaign clearly aimed at aggravating differences between Nigerians on the basis of especially religion, region and tribe. “A document in circulation, from the resolutions of a retreat in a foreign country by one of the parties makes no pretences about their plan to cause tension between various communities. “They have dramatically begun actions to destroy the integrity of the election process. He accused the opposition party of being bent on distracting the electorate by appealing to their sectional feelings. He said the Buhari administration is carrying out reforms which no other government had ever done since the country gained independence in 1960. “For the All Progressives Congress (APC) administration at the center, initial moves towards 2019 have been about the effort to publicise the administration’s achievements while at the same time dispelling negative propaganda by the opposition,” he said. “While it is clear that the opposition is unprepared for a contest based on policies programs, and past records of work, they are bent on distracting the attention of voters by appealing to sectional feelings and throwing voters into confusion. Churches and Mosques and other places of worship are being recruited for election propaganda. “We are proud of our achievement, but we must first of all make the voter to illustrate where we are coming from because without doing that, it is hard for many to appreciate the enormous strides the nation has made under the present dispensation. “If we had continued with the pace, corruption and ineptitude that characterized the war against Boko Haram in 2015, it would have taken us decades to eliminate the terrorists hold on Nigeria territory and have them confined to a little corner in the country by the banks of the Lake Chad. “The Buhari administration has shown the ability to take hard decisions, in the nation’s interest as has been seen in dealing with the economy.